The first installment of Tanaka Yoshiki's Legend of the Galactic Heroes was published in November 1982, and since then approximately 1.5 billion copies have been sold of his best-selling series of science fiction novels. Even now SF fans are still talking about his works, which have captured the hearts of many people. It's the middle of the 21st century, and humans have abandoned the Earth after it was contaminated from a nuclear war. They fly away in spaceships and eventually establish the Galactic Federation in AD 2801. Three hundred years later, a soldier by the name of Rudolf von Goldenbaum seizes power. As Emperor of the Galactic Empire, he reigns supreme and instigates a sweeping purge of the weakest members of society as he rules his autocracy. Those who have fled the repression of freedom have left the empire and created the "Free Planets Alliance." Furthermore, those in the Galaxy, who have become split between the Galactic Empire and the Free Planets Alliance, become embroiled in a cosmic war with no end in sight. The Galactic Empire and Free Planets Alliance launch a new war in the stellar region of Astarte. 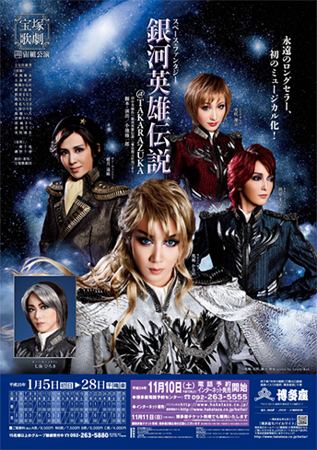 The commander of the Galactic Empire's fleet is Reinhard von Lohengramm, who has blond hair and ice-blue eyes. He is also a genius in the art of war who can boast of being undefeated. Confronting him in the Free Planets Alliance is Commodore Yang Wenli, called the wizard of invincibility. The Free Planets Alliance claims an overwhelming numerical superiority, but Reinhard presses his advantage through a strategy that exploits a chink in the armor of the enemy fleet formations. Ultimate victory rests in his hands. But what saves the Free Planets Alliance in a hair's breath from annihilation is Yang, who has taken over command of the Alliance's entire spacecraft fleet from his injured commander. Recognized for his deeds at the engagement in Astarte, Reinhard is appointed Marshal, even though he is from a lower-ranking family of aristocrats. At the ceremony marking the appointment, Reinhard meets Hildegard von Mariendorf (Hilda). The daughter of a Count, Hilda has long held a critical view of societies where power is perpetually in the hands of the highest-ranking members of the aristocracy. Now she sense the need for a new and strong leader. She believes the Reinhard would be right for this position. The comments of Hilda - of her passion for some day pouring all of her efforts into the reconstruction of the state under his guidance - deeply resonate with Reinhard. After the ceremony, Reinhard, together with Kircheis, his subordinate and confidante, visits the mansion of Reinhard's elder sister Annerose, who has become a mistress of the Emperor. The three, whose hearts are warmed by this first reunion in a long while, reminiscence about their childhood. When children, Reinhard and Kircheis were constant companions, while Annerose kindly watched over them. But then one day Annerose was abducted by the imperial household officials to Fredrich IV's inner palace. With his beloved sister taken from him, Reinhard firmly vowed that one day he would bring down the palace and take back Annerose. Reinhard goes on to distinguish himself in many different battles, eventually opening the Supreme Military Council after reining in the generals. Having appointed his staff officer Oberstein and some rising young officers, he embarks on a new course toward a realization of his old vow. However, the high-ranking aristocracy is grouped tightly around the palace and its power. Meanwhile, awaiting Reinhard is a battle without end against the Free Planets Alliance and its extraordinary commander Yang, whose genius Reinhard acknowledges. Final performance for Houju Ichi. Created by caithion. Last Modification: Monday 25 of February, 2019 07:33:12 PST by caithion.